Thomas Hutchinson is a litigator in Dykema's Los Angeles office. Mr. Hutchinson has nearly 30 years of experience representing product manufacturers and distributors, as well as local businesses and individuals in a variety of actions. He has represented clients with the defense of Lemon Law claims against vehicle manufacturers, prosecuting cases for vehicle financing and leasing companies as well as product liability and negligence defense on behalf of automobile dealerships. He also has more than 15 years of experience focused solely on the issues and problems involved with the complex asbestos litigation, both regionally and nationally. He spent more than a decade serving in a consulting/advisory role coordinating counsel on national asbestos litigation discovery issues for an OEM. 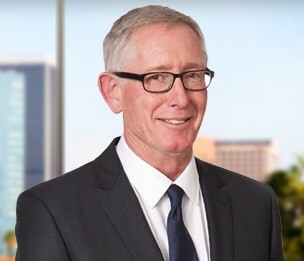 In that role he was initially responsible for handling hundreds of regional cases throughout California in preparation for trial, trial proceedings, and appellate practice before eventually serving as coordinating national counsel assisting in the development of litigation strategy, responding to and defending corporate discovery, and shaping settlement philosophy. In addition to his years of representing motor vehicle manufacturers and dealerships in product liability cases, Mr. Hutchinson has also handled premises liability and work related negligence claims, which along with his diverse personal experience, give him a substantial understanding of job site practices and conditions.